Em's Knitty Corner: Contest Winner & FO & Handdyed yarn!! Are you the lucky one! She just cruised by my blog that day, so I guess she's one of those people with lots of luck! By the way, my boyfriend pulled the name. I'm so happy with all the lovely comments I got, huge big thank you to all those who took the time to comment and let me know they are reading my blog! You can't imagine how much it means to me and you can be sure I'll be checking out your blogs too! Big thanks to Blueadt, Nicola, Becky, Karen, Lesha, Beth, Cathy, Emmy, Kelly, PieKnits, Juut, Lisa, Efa, Lynne, Rox. Sorry if I used your Blogname but it might mean I don't know your real name! Also a big thank you to all those others who are reading regularly but didn't comment, or don't comment much in general! I did modify the toes, as I always do. I couldn't get behind on knitting this pattern, right? Well, I do like the socks a lot, but I won't be knitting this pattern like crazy. There are way to many other patterns I like out there! 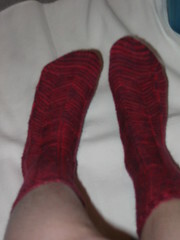 The red yarn is sock yarn I decided to dye. It's deep burgundy red, I love it! I can't wait to start knitting with it. The yarn didn't take all the dye and with the leftover I dyed some pure wool to felt which is nice pink. Didn't take a picture of that just yet. 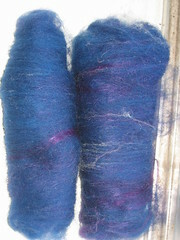 Some merino I died blue with some mohair I died purple. I started spinning it and it's quite nice! Though there is some VM in the mohair (I got it unwashed and undyed). But it'll be really nice for some wristwarmers or so! That's it for today, more in the near future! Em - you posted a comment to me but didn't include your email address. Mail me at trekcelt on yahoo. Both of your dyed yarn colors are gorgeous!! 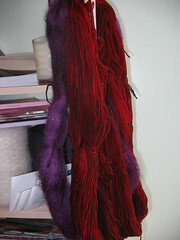 Reds and purples always seem so tricky- what kind of dye did you use? Your Jaywalkers look great! I've been very curious about the Fyberspates yarn. And you did a great job dyeing the mohair. I'm looking forward to seeing Butterfly! Wow, your Jaywalkers turned out so lovely - great colorline you chose! 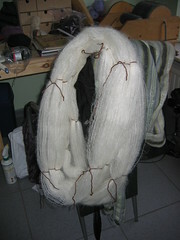 You did such a great job with dyeing the mohair, it looks absolutely beautiful! Have fun knitting, and cheers from Austria!